Who doesn't like a PB&J sandwich? Show your love for the world's favorite sandwich as eye art. I color-matched each shade to the real stuff. I only wish I could make it smell like a PB&J sandwich! 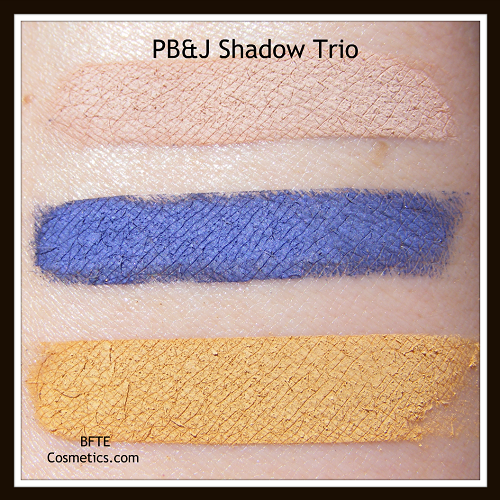 All three are matte shadows. This collection is for 3 sample jars that hold .3 grams each. A deep, matte purple that will make any purple shadow lover swoon. Contains - Mica, Titanium Dioxide, Iron Oxide, Ultramarines, Magnesium Stearate, Carnuba Wax, and Silica. NOTE: Not for use on the lips. This was swatched to match the color of light toast. A cool, tan matte that creates no allergies. A matte shadow that matches the Skippy in my pantry. This rich, butterscotch shadow is meant to create yummy looks. Contains - Mica, Titanium Dioxide, and Iron Oxide. Trio Sample jars have .3 grams of product in each jar. 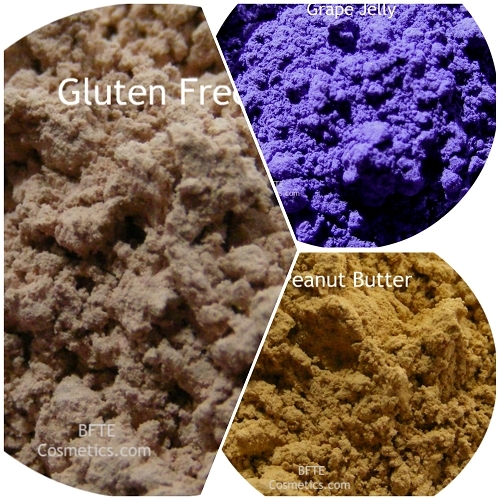 Just to make it clear: Our products contain NO gluten or nut products! I've been meaning to order this trip for a long time and I'm mad at myself for not doing it sooner! The colors are stunning on there own but together they are even better!